As noted on my "Facebook Memories", in general February 7 is a pretty awesome day. 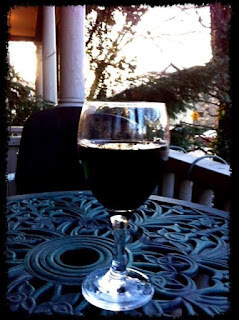 I've taken photos of me and my wineglass on the front porch after work on two years. Yesterday was warm...70 degrees...but wet. By the time I got home at 6:15, there was no rain, the temperature had dropped to 65 or so, but it was seriously dark! Feb 7, 2013...a fine day! This has been a super unusual winter here in Evansville...we've just had one dusting of snow, lots of really nice days folded into regular winter weather days. Not hard to take, but hard to get used to.